Marlon was selected as a GOJoven Guatemala Fellow at the age of 19. He began in leadership training processes when he was just 14 years old, and has been acquiring methods of learning, training and teamwork and to share with, advise, and motivate his peers – other young leaders. He has grown a lot personally in these five years and overcome barriers in the difficult work of promoting leadership and youth rights. 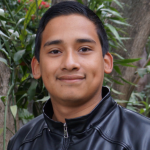 Marlon feels very grateful and impacted by the training experiences he has had, in particular the opportunity to receive the GOJoven Guatemala Scholarship. He is currently studying to become a Nursing Technician in Guatemala City and feels very committed to the empowerment of other young people and adolescents in particular in the area of health and well-being, in order to contribute to a better future for the next generations of Guatemalan youth.